Established in 1898 The Ossory Show Grounds are located at Coolfin, Kilbreedy, Rathdowney County Laois in the heart of Ireland. It’s central location makes it easily accessible from the M7 & M8 motorways. July 2018 will go down in history as the hottest and driest July on record. 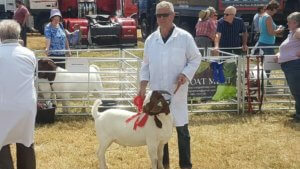 The history books will also be able to show, that this was the year the first ever Boer Goat Show was held in Ireland. Goats of different descriptions including Boers had been exhibited at various different shows throughout the Country in past years, but until now Boers had never had their own classes. The BBGS supported local members who organised the classes in conjunction with the Showground committee. The Judge on the day was Annie Richardson of County Mayo, and she had a difficult job as the standard of Boer Goat was very good. The members who exhibited were supported by other BBGS members who hadn’t brought animals but some had travelled hundreds of miles to see the first Boer Goat Show in Ireland. Quite by accident this event turned into a real social gathering of BBGS members when picnic baskets were opened and shared, and the talk of goats filled the air. Many visitors left with a fist full of information in the form of literature supplied by the BBGS, and some have gone on to acquire their own herd and become members themselves.